"A good chickpea salad, that is low-fat and high in protein." 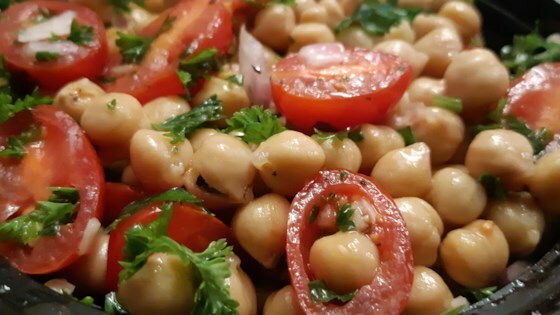 In a large bowl, combine the chickpeas, red onion, garlic, tomato, parsley, olive oil, lemon juice and salt and pepper to taste. Chill for 2 hours before serving. Taste and adjust seasoning. Serve. GOOD, BUT I SUGGEST LESS ONION, MORE TOMATO. I TRIPLED THE RECIPE, AND THE ONION WAS OVERWHELMING. I love this recipe. A few things I did differently: I used cilantro instead of parsley, and added a splash of balsamic vinegar. It was delicious. This was super fast and very easy to assemble. My husband loved it. I thought it was a little bland but I am not a big chickpea fan. It would be a great addition to a buffet table.